From Constantinople to the Frontier: The City and the Cities provides twenty-five articles addressing the concept of centres and peripheries in the late antique and Byzantine worlds, focusing specifically on urban aspects of this paradigm. Spanning from the fourth to thirteenth centuries, and ranging from the later Roman empires to the early Caliphate and medieval New Rome, the chapters reveal the range of factors involved in the dialectic between City, cities, and frontier. Including contributions on political, social, literary, and artistic history, and covering geographical areas throughout the central and eastern Mediterranean, this volume provides a kaleidoscopic view of how human actions and relationships worked with, within, and between urban spaces and the periphery, and how these spaces and relationships were themselves ideologically constructed and understood. The book is found here on Brill’s page. Profound cultural change defined the Byzantine world. For centuries after its embrace of Christianity, exchanges of ideas, objects, peoples and identities continued to flow across an empire that found itself located at the crossroads of so many other worlds. 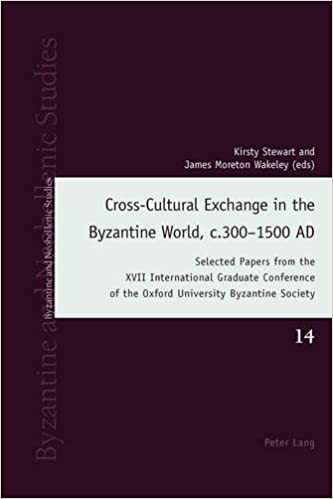 This book brings together a selection of important contributions to the study of cross-cultural exchange in the Byzantine world in its largest geographic and temporal sense. 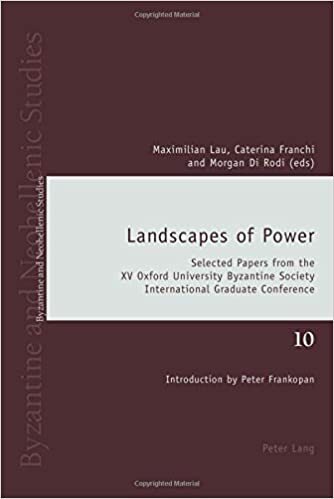 It employs an interdisciplinary and comparative approach, presenting papers first given by graduate and early career academic researchers from around the world at the XVII International Graduate Conference of the Oxford University Byzantine Society, held on 27 and 28 February 2015. The book is found on Peter Lang’s website here. This volume contains selected papers from the XV International Graduate Conference, highlighting the latest scholarship from a new generation of Late Antique and Byzantine scholars from around the world. The theme of the conference explored the interaction between power and the natural and human environments of Byzantium, an interaction that is an essential part of the empire’s legacy. This legacy has come down to us through buildings, literature, history and more, and has proved enduring enough to intrigue and fascinate scholars centuries after the fall of Constantinople. From religion and trade at the end of Antiquity, imperial propaganda and diplomacy at the end of the first millennium, to culture and conquest under the Komnenian and Palaeologan dynasties – this volume demonstrates the length and breadth of the forays being made by young academics into the still often undiscovered country of the Late Antique and Byzantine world. The volume can be purchased either through Peter Lang’s website or Amazon.